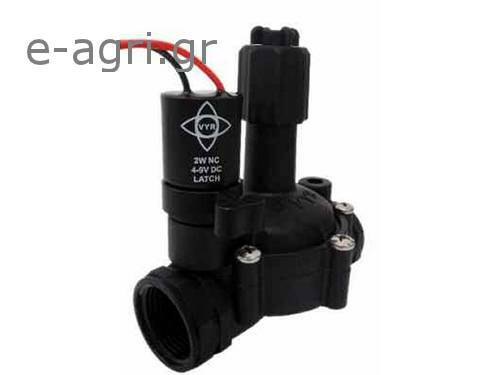 • Two way HIGH-FLOW valves, body design allows full flow. • 1", 1 1/2", 2" and 3" female thread BSP. • Kit for manual opening with 1/4" lever turn. • Valve body made of nylon 6.6 with 30% fibreglass. • Permanently clean because of the built-in steel mesh filter. • Assembled with screws, shaft and spring made of stainless steel. • Body with brass inserts for screws. • EPDM diaphragms reinforced with fabric. • 24 VAC solenoid (SEE OPTIONS). • Working temperature between 2 and 80 degrees. • Recommended working pressure of 1 to 12 bar. • Opening and closing response time of 0.5 seconds. • Resistance test carried out for 25,000 cycles at 15 bar and 80 degrees. • Removable from the upper section for repair or replacement of parts. • Works at very low flows, ideal for localised irrigation. • Resistant when operating with wastewater. • Complies with standard UNE 68-074-86/ISO 7714. • Professional landscaping, urban and commercial areas, sports fields, golf courses, residential and private areas. • Industrial use for fluid control. 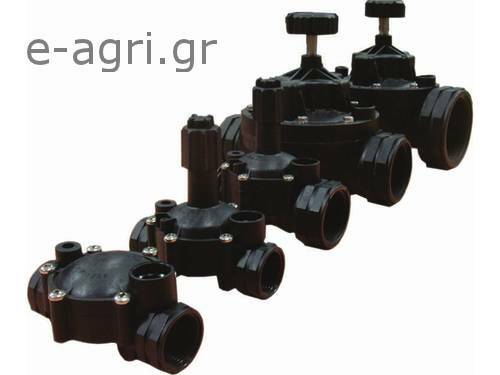 • Drip irrigation and agricultural installations in greenhouses and fields. •Width: 9 cm (1"), 9 cm (1 1/2"), 16 cm (2"), and 16 cm (3"). •Height: 14 cm (1"), 14 cm (1 1/2"), 21 cm (2"), and 22 cm (3"). •Length: 12 cm (1"), 14 cm (1 1/2"), 23 cm (2"), and 24 cm (3"). •Weight: 245 g (1"), 320 g (1 1/2"), 1400 g (2") and 1600 g (3").